Peacebuilders is an engaging and transformative leadership program for young people ages 16-28 who are interested in building a human rights community in Central Alberta. As Peacebuilders, participants will play a critical role in advancing the voice of Red Deer’s youth on issues related to diversity, inclusion and human rights and will work together to build a community where the rights and dignity of all are respected and upheld. 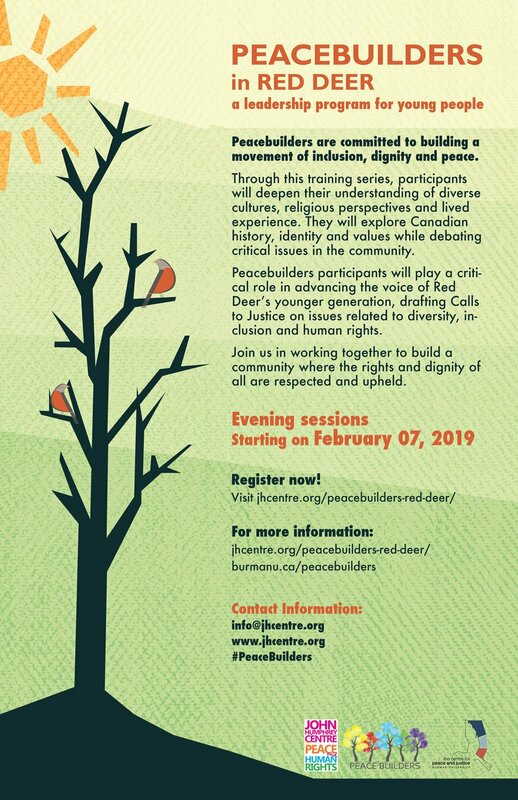 Peacebuilders meet, engage with, and learn from members of various social, ethnocultural and faith communities; reflect on key issues related to diversity and human rights; and explore Canadian history, identity and values. A dialogue to action process facilitates new relationships while engaging participants in change-making community organizing and advocacy. Participants will develop skills in communication, critical thinking and leadership. The program is free but space is limited to 20 participants. Acceptance into program is based on an application process and is not guaranteed. Parental consent is required for anyone under the age of 18.